We pulled together 14 of the year's most popular lightweight strollers and ultralightweight umbrella strollers and put them to the test. We took them on walks, brief runs, loaded them up with babies and supplies, folded and unfolded them, and tested out all the features. In the end, there were five lightweight strollers that emerged on top. They were the safest, most comfortable, easiest to use, lightest, and had some pretty great features. Our top 5 umbrella strollers are listed below, followed by in-depth reviews of 7 different models. Note that we have several other stroller reviews, including best luxury strollers, best double strollers, best jogging strollers, and best overall strollers. So be sure to check those out as well. To read more about how we arrived at this list of best lightweight strollers, see the bottom of this page. Now that we've gotten all that out of the way, let's get into our hands-on reviews! Here are the Best Lightweight Strollers of 2019! 1. 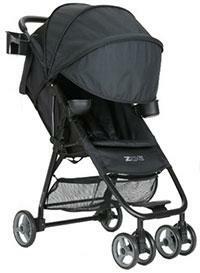 ZOE XL1 Deluxe Xtra Light Stroller System. This is the best lightweight we found, and all of our testers were thrilled with it! It's not exactly an umbrella stroller (see #2 for that), but it's super lightweight and portable. And features abound: there is a great snack holder and cup holder for baby, a detachable cup holder and storage pouch for the parents, front wheel suspension, a HUGE canopy (the biggest we tested), reclining seat, a peek-a-boo window to check on your baby (sleeping yet!? ), detachable padded front belly bar, rear wheel brakes, and a decently large storage basket on the bottom. Now, we want to be clear that this stroller doesn't fold like a typical umbrella stroller, instead it folds into a much shorter bit wider rectangle about the size of a small suitcase. It's about 26" high, 15" wide, by 7" thick, which is perfect for the overhead bin on an airplane. The wheels can be popped off to make it a couple inches shorter if needed. We suggest using this stroller from about 6 months of age, up until about 45-50 pounds maximum. Somehow they got all these great features into a super solid and sturdy stroller that weighs less than 10 pounds! On our scale, it was 9.8 pounds, which is really unbelievable for this type of quality stroller. They accomplish this by using a sleek aluminum frame with plastic additions (like the cup holders and belly bar), which is all lightweight. 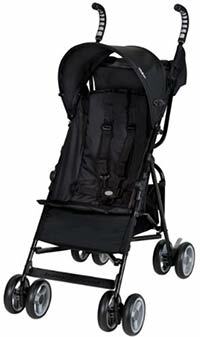 Surprisingly comfortable, this super lightweight stroller with an awesome feature set can be purchased for around $150. Cons? Well, we thought a carry strap would have been nice, but do note that they make a backpack that it slides into pretty nicely. 2. Summer Infant 3DLite Stroller. This is a true umbrella stroller that folds into a long narrow shape that can fit into even the smallest places (44" high, 14" wide, 12" deep). Deal with tiny European rental car trunks, small plane overhead bins, or a tiny urban apartment closet? This is probably a great option for you. Not surprising that this is one of the best selling strollers of all time, coming in at only 12 pounds and with some really great build quality, comfort, and features. Even with its light weight and low cost (usually under $100), this is not a flimsy stroller at all, and we thought that was really impressive. It turns well, has good brakes, and isn't tipsy at all. And the company Summer Infant has a very long reputation for reliability and customer service. We like the curvy lines of the frame, the handlebar shape and grips, the front wheel suspension, and the fact that it includes a carry handle (for when it's folded) which is surprisingly hard to come by! It has a good sized storage basket that is actually easy to access from the rear, a decent size canopy (but nowhere near the ZOE XL1), padded shoulder straps, and a pretty comfy seat (and deep recline). There's also a cup holder and little pouch for mom or dad. Cons? Well, we couldn't figure out how to get it to stand on its own while folded, and there are no cup or snack holders for baby. Outside of that, for this price-point you are really getting an exceptional stroller! 3. BIBA M Single Stroller. BiBA only recently began making their strollers available in the USA, and we are really excited about the potential for these high quality and stylish strollers to make a splash on the baby market! We're excited about their simple urban styling, high quality fabrics and parts, easy adjustments and folding, comfortable seating surface, versatility, and reasonable pricing (this one is around $199). In our hands-on testing we found the stroller to have some great features. Let's start with the canopy. Of course, you can have the canopy all the way up and out of the way. You can also put it down for a regular-size canopy. You can also extend the back of it a bit by unzipping to reveal a see-through mesh screen that you can use to peek down at your child (and them up at you!). Finally, there is an extra-large extension on the front that you can fold down for extra coverage and privacy. This feature makes for one of the largest canopies on this list, second only to the ZOE XL1. We also liked the almost-flat recline, which brings the seat down to about 150-degrees recline, nearly flat, or one of a couple other less reclined positions. There was also a large storage compartment at the bottom, though access to it was a bit difficult when the seat was reclined. Speaking of recline settings, the thigh support can also be set downward, flat, or at a little incline for toddlers who want to do criss-cross applesauce, or to keep things from rolling out of the seat. There is also a footrest for bigger toddlers and kiddos, a cupholder for mom or dad, wheel-brakes, a lightweight (about 11 pounds) aluminum frame, and smooth foam rubber wheels. We found it very easy to maneuver through tight spaces, and it folded up into a reasonably small package measuring about 28" wide, 20" long, and 11" high. Some additional things we liked were the chest pad on the 5-point harness, which helps with the flopping-forward factor, and the fact that you can buy some inexpensive accessories for it. For instance, a foot and leg cover for the colder months, for about $25, a mosquito net cover, and more. You can find all of these accessories at the BiBA USA website. Finally, this is one of the few strollers that uses the front handle-bar for kids, which kids like to use when they're sitting up and looking around. It can make pulling kids in and out more difficult of course, but if you don't like it you can just pop it off very easily. Supports from 6 months and older, and up to 33 pounds. So this is a great addition to our best lightweight stroller list, and we're happy to put it through some longer term testing to see how the quality holds up over time. No real major cons here, though it would be nice to have a cupholder for the kid, and to fold down into a smaller footprint like the ZOE does. Overall, this is a great option, so be sure to check it out! 4. Peg Perego Pliko Mini Umbrella Stroller. 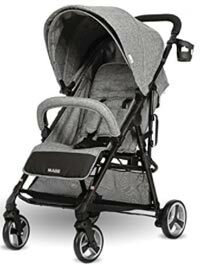 Another great option, but a bit more expensive than most other best lightweight strollers on this list, coming in around $250-300, and without quite as many features. The Pliko is an awesome, very well built, and very comfortable stroller that comes in a ton of great colors and patterns. Some great features include front wheels that can lock or swivel, locking rear wheel brakes, adjustable seat recline, adjustable foot rest height, adjustable handlebars for shorter or taller parents, and a very easy to use folding mechanism. Like the ZOE XL1 and BIBA M, this stroller also folds into a rectangle, but unfortunately one that is quite a bit larger, especially in terms of how thick it is when folded. It is about 11 pounds, coming in slightly heavier than the ZOE XL1. 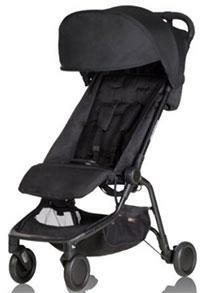 In terms of capacity, this stroller is suggested for babies about 6 months old up to about 45 pounds. The nice wide seating surface makes this possible - our 4 year old fit into it just fine, and I could see him using it after a hot day walking through an amusement park. We found the folding mechanism really easy to use with only one hand, which is great if you're holding baby with the other! It also stands upright alone really easily when folded. So overall this is a great stroller, with far fewer features than the ZOE, but with great build quality and some other good additions like adjustable handlebar height, and a super easy folding mechanism. Cons? Well, we thought it felt a bit more flimsy than the ZOE, and of course it doesn't include anywhere near as many features. The canopy is relatively small as well, and the storage pocket isn't as easy to access. Also, it's usually about $100 more than the ZOE, and we don't see any great reason why that's the case. 5. 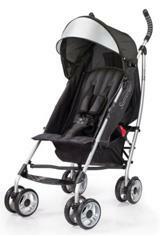 Baby Trend Rocket Lightweight Stroller. This is a great, well-featured and reasonably priced (only about $50) umbrella stroller. Baby Trend has a good reputation for making good quality products at very reasonable prices. Nothing fancy here, but definitely great bang for the buck! This is a classic umbrella stroller that folds up to a long and narrow form, but then folds in half vertically again to make for a very compact stroller that fits nicely into an overhead bin. In our testing, we found some things that we really loved. First, this is a great stroller for tall parents. The top of the handles is over 40" above the ground, which makes it much easier for tall parents to reach the handles without hurting their backs. If you're really looking for tall strollers, this is a good option, another even taller option is the Joovy New Groove, which is about another inch taller. Second, the ride was surprisingly smooth and handling was nimble, and the brakes worked pretty well, and we loved the 5-point harness which is sometimes rare on an inexpensive umbrella stroller. Third, the handles were comfortable, there is a little zippered pocket for your keys or phone, there are cup holders for parents, and it feels much more durable than some of the other inexpensive umbrella strollers we've tested. Finally, we found the fabric easy to clean yet comfortable enough for baby. It's designed to support babies who can sit upright on their own without support (it is not made for infants), all the way up to 50 pounds. We did notice, however, that the seating surface itself is a bit narrow so it's better for the tall-and-lean than the short-and-chunky kiddos. Of course, we're talking about an umbrella stroller here so it has many of the same limitations as other umbrella strollers: very limited recline functionality, small and fickle wheels, and a small canopy and storage basket. At this price, those limitations aren't surprising, but they're worth mentioning. Overall, this is a great lightweight stroller that offers high bang-for-the-buck! 6. Mountain Buggy Nano Stroller. This is a very minimalistic stroller that is great for traveling. Heading to Europe for an adventure with a baby or toddler? This might be a great solution for you. It folds into a carry-on size for airplane travel, and is super compact even when opened. Not for big chunky monkey babies or toddlers, the seat is rather narrow and we think it reasonably tops out around 40 pounds. The stroller itself weighs 13 pounds, which was heavier than we were expecting, especially given the minimalistic design and features. But we found it really clever in its design, well built and reliable, and narrow enough to fit through little European doorways. Folding was easy enough, but we found that it really required 2 hands. It folds up nice and small (12" by 22" by 20") and fits into its own (included!) pouch, and has a built-in carrying handle. Even with its minimalist design, it has some good features for travel: adjustable footrest, rear wheel suspension, and a canopy with a nice extension to block sun or rain. Overall, if you're planning on doing some serious traveling with baby, this is the way to go. Cons? Well, it doesn't have anywhere near the features as the top lightweight strollers on this list, and there are some minor annoyances. Like when it's folded up the canopy interferes with your hands gripping the handlebar, there's no cup holder, and the storage basket is small. Not to mention it's pretty pricey! 7. 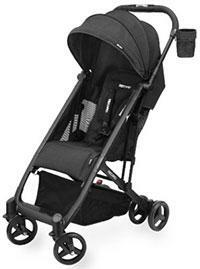 RECARO Easylife Ultra-Light Stroller. This is one of the heavier strollers on this list coming in at just under 13 pounds. But we really like its style, flexibility, and features. It's a really functional stroller that feels super sturdy and well built. Maybe this isn't so surprising given RECARO's history of making high quality products, and its popularity in Europe. For use with babies from about 6 months of age up to 50 pounds, this stroller is super portable, stands on its own when folded, and has highly breathable surfaces (including mesh sides which are awesome for keeping baby cool on summer days). It has a sleek, super simple design and frame, that looks great. All wheel suspension makes for a nice smooth ride, and we thought it did a great job cornering in tight spaces. The canopy is decently sized, and includes an extra extension for those bright or rainy days. A somewhat small storage basket is easily accessible and sturdy, and there is a detachable cup holder for parents. The recline was also quite good, though it didn't go anywhere near flat when fully folded. There were some things that were really easy about this stroller, including the one-handed folding, padded shoulder straps, smooth steering (even with one hand), and rear wheel brakes that were surprisingly easy to use. The steering is helped by the fact that there are single (rather than double) wheels up front. So overall this is a really excellent stroller. Cons? Well, it's a bit heavier than most lightweight strollers, folds into a size quite a bit larger than the ZOE, has no carrying strap, and we had an issue once where the front wheels were locked after unfolding (though that only happened once). Easy Folding. All of the best umbrella strollers are lightweight, and this is a really critical characteristic. You're buying a lightweight travel stroller for a reason. You want it to be quickly and effortlessly fold up and fit into the half-full trunk of a compact car, fit into the overhead bin on a plane, fit neatly into an apartment closet (or restaurant coat area! ), or to strap onto a suitcase during travel. Folding with only one hand is even better. You also want it to unfold with ease and not too much hassle, preferably also with just one hand. These were really important features for us. There are basically two folding modes for the strollers we review here. First, the traditional umbrella stroller folds by squeezing the two handles together and then folding in half lengthwise. Second, other lightweight strollers fold by collapsing lengthwise, usually using three folding points. Either way, you're going to be able to fit these into the overhead bin of a normal size airplane (though usually you can just gate-check a stroller), into the back of vehicles with smaller trunk areas like a Jeep Wrangler, and into the corner of a restaurant without taking up too much space. Safe and Reliable. The best umbrella strollers will fold easily, but won't fold up with your baby inside, or have several exposed hinges that could pinch their little fingers. The stroller needs to have a 5-point harness, not tip over easily, have good locking wheel brakes, and have a sturdy build quality that will last for years. 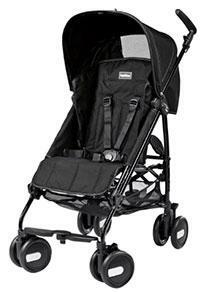 There are many lightweight strollers on the market that are flimsy, tipsy, and won't last you more than a year. Those don't show up on our list. Comfy and Lightweight. There's a trade-off between a super comfortable stroller and a super lightweight stroller: rarely will you find a stroller that meets both of those needs, especially not an umbrella stroller. To keep an umbrella stroller super lightweight (under 10 pounds), you often compromise a bit on seat, head, and side cushioning. The best lightweight strollers strike a good balance between weight, build quality, and comfort. For more information about how to pick a stroller, check out our full stroller buying guide.